DEMOCRAT SETH MOULTON'S defeat of US Representative John Tierney in the 6th Congressional District primary last week came right on schedule. Iraq War veteran Seth Moulton, left, defeated nine-term US Rep. John Tierney in last week's primary, becoming the the first Massachusetts Democrat in 22 years to oust a sitting member of Congress from his own party. The political newcomer, an Iraq War veteran with three Harvard degrees, was the first Massachusetts candidate in 22 years to vanquish a sitting congressman from his own party. It last happened in 1992, when upstart Marty Meehan booted incumbent Chet Atkins in the Fifth Congressional District, then went on to win the seat in November. It was 22 years before that, in the Third Congressional District primary in 1970, that Father Robert Drinan, an antiwar liberal, toppled fellow Democrat Philip Philbin, who had first been elected to Congress in 1942. So if history is any guide, it will be around 2036 the next time a member of the Massachusetts congressional delegation is overthrown in a primary election. Maybe even in a general election: That hasn't happened since 1996, when Peter Blute and Peter Torkildsen, the last Massachusetts Republicans to serve in the US House, were ousted after just two terms. Critics of legal limits on congressional terms routinely claim that such restrictions aren't necessary. "We already have term limits," they say. "They're called elections." But in the Bay State as in most states, members of Congress generally keep their title for as long as they wish. Except for open seats, elections are rarely more than a formality. Incumbents and their courtiers pay lip service to the people's right to choose their leaders. Yet in reality they view electoral challenges as a kind of blasphemy. 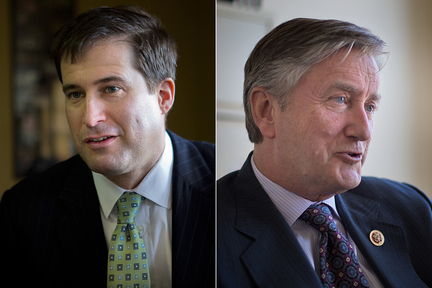 The establishment scorned Moulton for presuming to take on a nine-term incumbent. "He doesn't represent a threat to Tierney, who's doing everything right to represent his district," a Washington-based Democratic strategist told the Boston Globe last summer, then added condescendingly: "Someday, he'll have a bright future." A phalanx of political insiders lobbied for Tierney's re-election. In a column published just days before voters rejected Tierney's bid for renomination, Barney Frank dismissed as "fanciful" the notion that a newcomer like Moulton might prove more effective than the 18-year insider. Even at the Democrats' "unity" breakfast the morning after the primary, Moulton was treated coolly. The party's new Democratic nominee was sidelined for an hour and 45 minutes before finally being introduced to the audience. It's not hard to understand why so many members of Congress come to regard incumbency much as medieval kings regarded the crown — theirs by divine right. The Economist noted recently that while 30 percent of Europe's monarchs have been replaced since 2012, less than 4 percent of US House seats are seriously competitive in the November midterms. Kings and queens aren't as hard to extricate as congressional incumbents. But wait! Maybe this year will be different! Pollsters report that Congress has never been as despised as it is right now. In one national survey, 72 percent of likely voters say it would be better for the country if most incumbents were defeated this November. In another, only 29 percent of voters think their own representative deserves re-election. According to Gallup, public confidence in Congress is at an all-time low, with a pitiful 7 percent of Americans expressing confidence in the national legislature. Ten weeks before Massachusetts Democrats jettisoned Tierney, Virginia Republicans, even more dramatically, ejected Eric Cantor — the first time any House majority leader has been defeated in a primary. Two other GOP incumbents, Ralph Hall of Texas and Kerry Bentivolio of Michigan, have also lost to primary challengers. Could this be the writing on the wall? Are voters readying a Nov. 4 massacre? For all the evidence of public disgust with Congress, House incumbents typically have little trouble holding onto their seats. 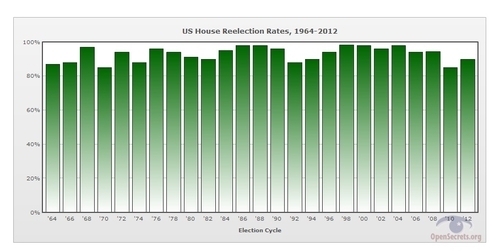 Even in "anti-incumbent" years, re-election rates are about 90 percent. On both left and right, there are voices suggesting as much. "I think we've heard an offshore warning, and I think a tsunami could be coming," MSNBC's Chris Matthews said after Cantor's defeat in June. In the Detroit News, editorial page editor Nolan Finley foresees "an anti-incumbent wave that could become a kick-the-bums-out tsunami by Election Day." It's a sweet dream. But don't count on seeing it come true. No matter how disgusted Americans get with Congress, no matter how vehement the nation's "anti-incumbent" mood, roughly nine out of 10 US representatives who seek re-election win it. Over the last three decades, Congress's plunging approval rates notwithstanding, the re-election rate for House members has dipped below 90 percent only twice. Gerrymandered districts, polarized voting blocs, and weak (or nonexistent) challengers are more than enough to keep most members of Congress safe. No "tsunami" endangers Capitol Hill. Tierney's defeat isn't a straw in the wind, but an exception to the rule. Expect another in, oh, 22 years. From child refugee to Green Beret — to Congress?